Gamma spectroscopy is the science (or art) of identification and/or quantification of radionuclides by analysis of the gamma-ray energy spectrum produced in a gamma-ray spectrometer. Broadly, spectroscopic gamma ray detectors and spectrometers are of two types, high resolution, based exclusively on cryogenically cooled germanium (HPGe) detectors or medium to low energy resolution based on scintillators or room temperature semiconductors. In the examples below, the left-most spectrum is from a scintillation detector and the right hand one is from an HPGe detector. ORTEC is a world leader in the manufacture of HPGe detectors and in the cooling of these detectors with cryo-coolers, having lead this technology since the early 1980’s with a string of innovations in crystal, cryostat and cooling technologies. 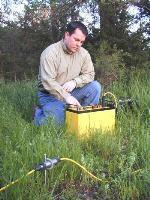 More about HPGe Detectors. . .
Thallium-doped sodium iodide NaI(Tl) is the most commonly used spectroscopic scintillation gamma-ray detector material. Detectors based on this material have energy resolution perhaps 45 to 50 times worse than typical HPGe detectors, but they offer the benefit of lower cost, potentially larger sizes and room temperature operation. More recently, Lanthanum Halide based scintillators have become available, offering much improved energy resolution. (On the order of a factor two over NaI(Tl).) While neither type offers energy resolution comparable to HPGe, it is the needs and constraints of the application which define the optimum choice of spectroscopic gamma-ray detector. More about Scintillation Detectors. . . The essence of a spectroscopic photon detector is that it provides an output pulse which is proportional to and ideally in linear proportion to the energy of the gamma ray detected. After suitable amplification and noise filtering, this pulse can be “histogrammed” in a multichannel analyzer to create the familiar gamma-ray spectrum. ORTEC offers a wide range of both modular and integrated electronics to support these requirements as well as an exciting range of “ALL-IN-ONE” gamma spectrometers. Software specifically designed to meet the needs of the application in hand is a key element of a good measurement system. 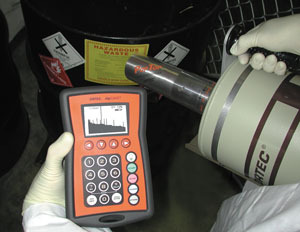 ORTEC offers a wide range of hardware in the form of radiation detector and data acquisition systems. It is often the application software which turns the “hardware into the solution”, and ORTEC has software covering a broad spectrum of nuclear measurement applications, often providing integrated hardware control, display and analysis in a single package. More about ORTEC Applications Software. . . The all-in-one HPGe Gamma Spectrometer is a recent and growing innovation from ORTEC. Our rapid development of electromechanical cooling for these systems has been the enabling technology. Ideal for applications such as waste assay and portal monitoring systems. Low Frequency Rejector (LFR) improves spectrum resolution in noisyenvironments. Download the IDM data sheet. The quality of a laboratory HPGe spectrometer in a convenient field-proven package. Tough — Enclosure, Display, and all connections sealed against moisture and dust.Water spray resistant. Download the Micro-trans-SPEC data sheet. Download the trans-SPEC-DX-100T data sheet.